2243, Used Rims, 17X7, 5 LUG, 4-1/2", 05-06, CHRYSLER, 300, CHROME CLAD, 8 SPOKE, ALLOY. 3243, Used Rims 15X6-1/2, 4 LUG, 4-1/4", 98-00, FORD, CONTOUR, 8 SPOKE, ALLOY. 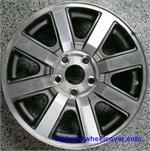 3245, Hubcap, 15", 05-06, CHEVY, EPICA, 8 SPOKE TYPE. 3520a, Used Rims, 18X8, 6 LUG, 135mm, 03-04, LINCOLN, NAVIGATOR, WITHOUT TPMS, 8 SPOKE, CHROME, ALLOY. 3581, Used Rims, 18X7, 5 LUG, 4-1/2", 05-07, FORD, 500, FIVE HUNDRED, LIMITED, 8 SPOKE, RAISE ON EACH SPOKE, BRIGHT FINISH, ALLOY. 3655, Used Rims, 18X7, 5 LUG, 4-1/2", 07, FORD, MERCURY, FIVE HUNDRED, MONTEGO, 8 SPOKE, CHROME CLAD, ALLOY. 3693, Used Rims, 20X8, 8 LUG, 170 MM, 08-10, FORD, F250SD, F-250SD, TPMS, 8 SPOKE, FORGED POLISHED ALLOY. 3694, CENTER CAP USED, 17", 08, FORD, TAURUS, X, POLISHED, BLUE FORD OVAL, CHROME WORD FORD,5 LUG NUT HOLES, 5 PLASTIC CLIPS & WIRE, 6" DIA. 4002, Hubcap used, 14", 67, OLDSMOBILE, F85, MACHINED, WITH OUT WIRE TYPE, 8 SPOKE TYPE, RIDGES BETWEEN SPOKES WITH BLACK BACKGROUND, INDENTED CENTER WITH BLACK RING, BLACK WORDS OLDSMOBILE, AND LOGO, METAL CLIPS. 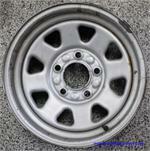 4045, Used Rims, 16X6-1/2, 5 LUG, 115mm, 02-04, BUICK, RENDEZVOUS, 8 SPOKE, CHROME, ALLOY. 4047, USED RIM, 16X6-1/2, 5 LUG, 115MM, 03-04, BUICK, LESABRE, PAINTED SILVER, ALUM, 8 SPOKE. 4048, CENTER CAP USED, 03-05, BUICK, LESABRE, CHROME, 8 SPOKE, EMBOSSED LOGO, 5 METAL CLIPS & WIRE RING. 7-1/2" DIA TIP TO TIP. 4048, Used Rims, 16X6-1/2, 5 LUG, 03-05, BUICK, LESABRE, OPT PY1, 8 SPOKE, CHROME, ALLOY. 4055a, CENTER CAP USED, 05-08, BUICK, ALLURE, LACROSSE, CHROME, DARK GRAY CENTER, CHROME LOGO, 8 RIVETS, 8 SPOKES, 6-1/8" DIA. 4055a, CENTER CAP USED, 05-08, BUICK, ALLURE, LACROSSE, CHROME WITH DARK GRAY CENTER WITH CHROME LOGO, 8 RIVETS IN CENTER, 8 SPOKES ON OUTER EDGE, 5 PLASTIC CLIPS AND WIRE RING. 6-1/8" DIA. 4055b, CENTER CAP USED, 05-08, BUICK, ALLURE, LACROSSE, CHROME, CHROME LOGO, 8 RIVETS, 8 SPOKE, 6-1/8" DIA. 505, HUBCAP USED, 14", 95-96, EAGLE, TALON, SPARKLE SILVER, 8 SPOKE TYPE, ENGRAVED LOGO, PLASTIC CLIPS & WIRE RING. 505, HUBCAP USED, 14", 95-96, EAGLE, TALON, SPARKLE SILVER, 8 SPOKE TYPE. ENGRAVED LOGO IN CENTER, PLASTIC CLIPS & WIRE RING.